Okay, so check this out. 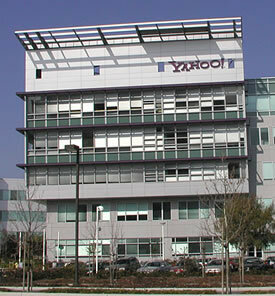 I went to Yahoo! today to work on a project for work and was a little surprised to see that it still hadn’t lost its culture. The purple and yellow cubes are still there. I was immediately reminded of the bottled pre-bubble-burst naive optimism that every dot-com used to ooze from its pores. Yahoo! alas is no longer a little snot-nosed kid, it’s transforming itself into a mature organization. Sure, the foosball tables and the free soft drinks are all there, but things are a little different. Don’t get me wrong, it’s still a dot-com, but it seems to be much more now. So, I am sitting in the cafeteria with Kevin and Chad talking about our work there, when we see Jerry Yang walking across the floor. Funny, he didn’t seem to be any smarter than anyone else in the room. Actually, deep inside he probably knows that he got lucky, very lucky. Either way it was weird to be four feet from a guy that is a billionaire of the “new economy.” He’s a celebrity for geeks everywhere, for better or for worse. I wanted to talk to him, but I was with some of my work peeps. Maybe next time I’ll be able to give him a quick hello, from one optimistic geek to another.